A music therapist helps their clients improve their mental and physical health through musical experiences and techniques. Below explains what a music therapist is and why their work is so important. Music therapy is a clinical and evidence-based discipline that uses musical interventions to overcome barriers and reach individualized goals within a therapeutic relationship between a client and credentialed professional. Music therapy is a well-established health profession where music is used within a therapeutic relationship to remedy social, emotional, physical and cognitive problems. Music theory is conceptually rooted in psychotherapy, clinical therapy, music theory and bio-musicology. There is a growing library of qualitative and quantitative research that supports music therapy and its applications. Music therapy research supports its effectiveness in providing emotional support, helping with physical rehabilitation and increasing motivation to engage in treatment. According to the American Music Therapy Association, a music therapist works with clients of all ages in various settings, such as schools, acute hospitals, and rehabilitation centers. They also work in day care, assisted living and community mental health facilities. Music therapists are almost always members of an interdisciplinary team of mental health and health care professionals who collectively support the goals of each client. They provide unique music-based therapy services to clients with cognitive, physical, psychiatric and developmental problems. For example, music therapists help their clients overcome grief, anxiety, depression and trauma from abuse. They also work with clients who have autism, cancer, chronic pain, dementia and Alzheimer’s disease. 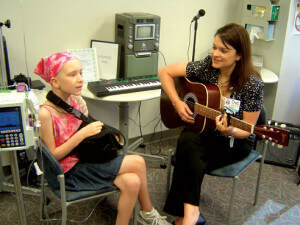 Music therapy generally follows the format of most clinical client-therapist centered sessions. Once the music therapist has assessed the needs and strengths of their client, they provide a customized music-based therapy session, which involves every aspect of music. That is, clients will sing to, move to and listen to music. They may also create and practice their own simple compositions. Through the musical experience in a clinical and therapeutic context, the client will experience psychological improvements that are intended to transfer to other life areas. Music therapy provides rare communication channels for those who struggle with expressing themselves. What Education Does a Music Therapist Have? Anyone who wishes to become a music therapist must have a bachelor’s degree in music therapy, which will include equal emphasis on both artistic music and clinical therapy. Many music therapists pursue a master’s degree in music or counseling therapy. Some music therapists become certified recreational therapists through the National Council for Therapeutic Recreation Certification. Eligibility for NCTRC certification includes the completion of a bachelor’s degree, supervised internship of almost 600 hours and NCTRC exam. There are limited academic eligibility exceptions for students with extensive training and experience. However, all music therapists must take continuing education classes to maintain their accreditation. The music therapist should hold a current professional board certification, such as MT-BC. However, they may also hold an American Music Therapy Association accreditation, such as Certified, Registered or Advance Certified Music Therapist. The ideal candidate will have a few years of experience working with children, adolescents or adults in an art, education or mental health setting. Music therapists should have a working knowledge of human development, music therapy and mental health assessments. They must have the interpersonal and communication skills required to establish healthy therapeutic relationships. In short, a music therapist has a genuine interest in helping and empowering others to recover and achieve their goals. Being a music therapist will require a caring attitude and professional competency.